Markets are lower this morning, responding to an API report that disappointed many traders. Crude oil saw modest gains of 36 cents yesterday, with prices seesawing up and down before ending higher. Prices are currently $50.58, with 72-cent losses (-1.4%) erasing yesterday’s gains. 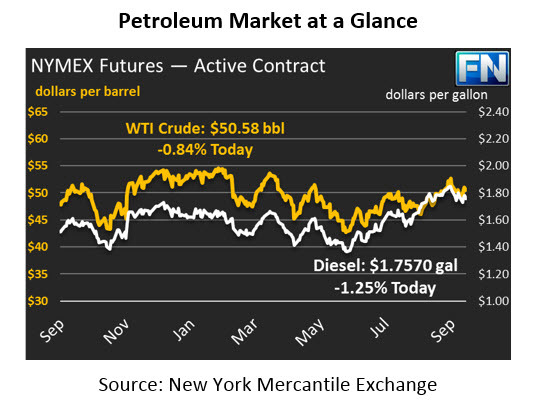 Keep in mind, however, that crude prices began the week at $49.25, so prices are still up for the week. Refined products are following the market lower, though diesel price losses have been steeper than gasoline losses. Diesel markets are down 2.9 cents (-1.6%) to $1.7570 this morning, driven by unsupportive API data. Like crude, though, today’s losses have not erased the week’s gains, and prices are still 2 cents higher than their opening price on Monday. Gasoline prices have seen only small losses this morning, supported by a stock draw that was larger than expected. Gasoline prices are $1.5982, down just 1.1 cents (-.7%) from yesterday’s close. Gasoline has outperformed the market overall this week, gaining 4.1 cents between Monday and today’s price. The API’s inventory report yesterday caught the market off guard, with a surprise crude oil build contrasting against the market’s expected draw. We mentioned yesterday that markets were geared up for a week of bullish reports, and yesterday’s letdown caused markets to shudder. Crude oil inventories gained 3.1 million barrels (MMbbls) this week, and diesel inventories gained 2 MMbbls. Gasoline was alone in its inventory drawdown, shedding 1.6 MMbbls. The IEA, EIA, and OPEC have all released their monthly updates, and those reports will likely become the focal point of the market once the initial shock from the API report wears off (assuming, that is, that the EIA data is in line with, or more supportive than, the API numbers). Both the EIA and OPEC predicted stronger economic growth driving higher oil demand in 2018, while the IEA kept its demand forecast the same at 1.4% growth. OPEC production was seen to be unchanged or mildly higher in September, driven by high production in Iraq and Libya, while Venezuelan production losses tempered the gains. Most reports point to market conditions next year mirroring this year. Overall the IEA noted that, “For next year, crude and product markets look broadly balanced, assuming OPEC holds output steady at around current levels.” Buried in the OPEC report, the organization predicts, “Oil prices are expected to remain at $50-55/b in the next year.” In general, while markets have been supported by strong fundamentals this year, there’s little upside remaining next year. The possibility remains, of course, that OPEC comes through on threats to extend production cuts through the end of 2018, or that economic growth will jump higher, bring prices out of the current high-$40’s to low-$50’s range.